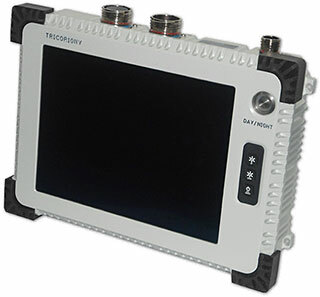 The TRICOR series embedded rugged computer combines a built-in touch screen available at various diagonals (8.4/10.4/12/15 inches & more) with excellent optical specifications; embedded with wide range of ultra low power Intel Embedded Processors based Single Board Computers (PIP3x Family). The features are flexible and can be chosen according to the application performance requirements with Quad Core i7 CPU Family, Memory, Storage, Display size (denoting as "X" in the TRICOR Model number), with EMI Protection, and other additional I/Os. All this comes within a small footprint of a standalone monitor / portable laptop, and therefore saves space. The special feature of the TRICOR is that it comes without a fan or air vents. The TRICOR series has built in I/O expansion over mPCIe & PCIe-104 bus, allowing for additions of I/Os to meet future requirements. Generally the TRICOR will have wall mounting provisions given on rear side within the VESA* dimensions. Additional brackets may be designed according to the mounting requirements. (e.g. L-brackets for 19" Rack mounting etc.). The TRICOR model is constructed from military grade, high strength, and light weight HE30 grade aluminum alloy housing. Its modular architecture allows the system to be easily configurable with many options. The fanless design helps in noiseless operation, increases reliability, and gives the system a longer MTBF. Display 12.1" 12.1" 1024 X 768 XGA Sunlight readable resistive Touch Screen, 16.2M colors. Specifications marked with * is an optional feature OR it differs from product to product & its configuration. All information contained herein is subject to change without notice.